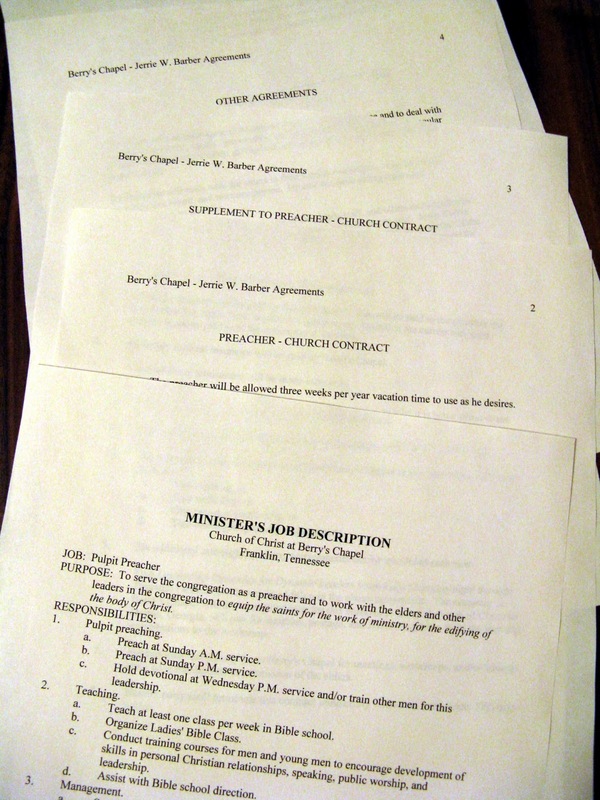 But why does a church and a preacher need a contract? We’re Christians aren’t we? We’re honest aren’t we? We trust each other don’t we? My plan in the next few posts is to explain what I have learned from the University of Hard Knocks, whose school colors are black and blue and the school yell is: “OUCH!” I have learned that contracts are not for dishonest people. Contracts are to preserve and protect agreements made by dead people and forgetful people. The first two congregations where I preached, I did not have a written agreement. We talked about some things, omitted some important issues, and recorded nothing to which we could later refer. When I took my first week off, to my dismay, I realized that we had not discussed vacations. I assumed that every preacher received a week or two off each year with pay. I returned from visiting family during Christmas and did not have a check for that week. After some conversation, one elder said, “He didn’t do nothing. Don’t give him nothing.” The eldership remained united on that decision. I discussed that with the next congregation and had a verbal agreement that I would have two weeks’ vacation each year with pay. I had learned an important lesson: don’t assume.